This page describes a landslide tsunami scenario that is both realistic and imminent. This landslide and its tsunami could occur at any time. The scenario is also considered to produce a typical local tsunami off of Southern California -- most coastal communities would experience waves of less than 2 m in amplitude. The scenario addresses what is both possible and probable. These tsunami source characteristics were input into the software package TOPICS to calculate the tsunami shape about 3 minutes after landslide failure began. The tsunami generation time and tsunami period are both about 3 minutes in duration. TOPICS assumes catastrophic failure of the entire landslide. The tsunami source from TOPICS is approximate, yet captures those features needed to assess tsunami hazard. 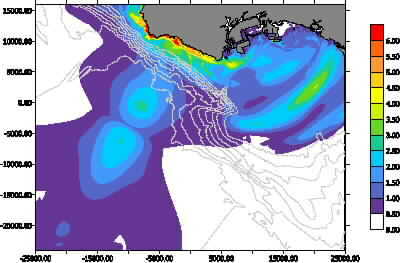 This contour plot maps the tsunami shape as input into the propagation code Geowave about 3 minutes after landslide failure began. Blue indicates an elevation wave while red indicates a depression wave. Note that the blue and red colors have different vertical scales. 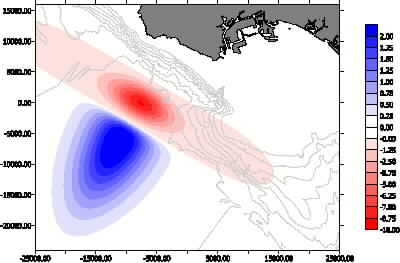 The tsunami propagation and inundation model Geowave simulates coastal tsunami attack and is arguably the most reliable tsunami propagation code in the world. A uniform grid size of 50 m was used for this numerical simulation. 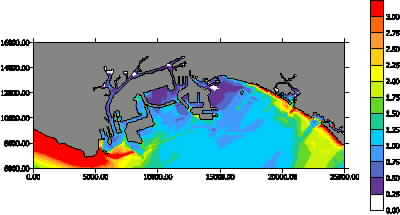 This plot summarizes the scenario results by providing the maximum tsunami amplitude encountered at each location and at any time during the simulation. It shows where the waves were large, and where the waves were small. Almost all of the large wave amplitudes are restricted to the coastline of Palos Verdes. However, an underwater mound is also seen to focus tsunami waves onto Sunset Beach, located at the upper right hand side of the image. This tsunami would impact Orange County in addition to Los Angeles County. 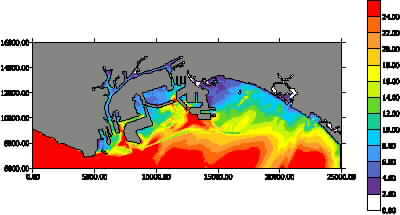 By changing color scale and enlarging the shoreline, maximum tsunami amplitudes can be discerned for the Ports of Los Angeles and Long Beach as well as the City of Long Beach. Waves up to 3 m above sea level attack the outer rim of the Ports. These waves arrive between 10-20 minutes after landslide failure. Waves up to 1.5 m are found to resonate within certain harbor basins for hours, in part because the tsunami period matches some of natural frequencies within the Ports. The wave amplitude increases significantly as it reaches shore along the Long Beach Peninsula, parts of Seal Beach, and most of Sunset Beach, in that order. A plot of maximum water velocities indicates that ships would be subject to currents of one or more knots throughout large regions of the Ports. Ships that are not moored or anchored could be expected to travel several hundred meters laterally as the waves rebound within the Ports. Entrances to channels and basins experience the highest water velocities. Water velocity is also seen to increase near the shoreline of Long Beach Peninsula, Seal Beach, and Sunset Beach. These waves arrive at least 26 minutes after landslide failure, giving plenty of time to evacuate the beaches if a warning system indicated an approaching tsunami. This tsunami also attacks coastal communities with a leading depression wave, giving those who observe the sea recede several minutes to seek shelter. The maximum water flux is a proxy for maximum water pressure or water force. Water pressure is responsible for damaging structures, including oil storage facilities and homes. 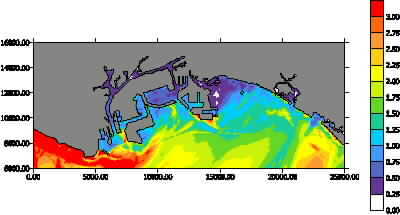 This image shows the regions within the Ports and along the shoreline most susceptible to water damage. Note that some locations experience large amplitude waves or high water velocities without significant mass flux. These locations are more likely to be spared severe wave damage. © 1999-2011, Applied Fluids Engineering, Inc.